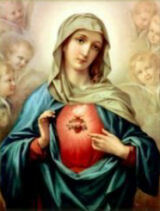 O Mary Immaculate, inflame our hearts with one ray of the burning love of thy pure heart. 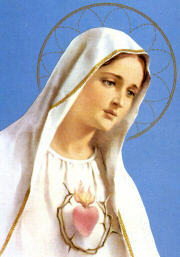 The month of August (Overview - Calendar) is dedicated to the Immaculate Heart. Since the 16th century Catholic piety has assigned entire months to special devotions. The month of August is traditionally dedicated to the Immaculate Heart of Mary. The physical heart of Mary is venerated (and not adored as the Sacred Heart of Jesus is) because it is united to her person and is the seat of her love (especially for her divine Son), virtue, and inner life. Such devotion is an incentive to a similar love and virtue. Pope Paul VI, on the floor of the Vatican Council at the close of the third session, renewed publicly the consecration of the Church and the world to Mary's Immaculate Heart. He said that his thoughts turned to the whole world "which our venerated predecessor Pius XII . . . not without inspiration from on high, solemnly consecrated to the Immaculate Heart of Mary. . . . O Virgin Mary, Mother of the Council, to you we recommend the entire Church." 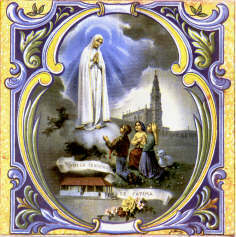 When he visited Fatima on May 13, 1967, the same Pope recalled this "consecration which we ourselves have renewed on November 21, 1964  we exhort all the sons of the Church to renew personally their consecration to the Immaculate Heart of the Mother of the Church and to bring alive this most noble act of veneration through a life ever more in accord with the divine will and in a spirit of filial service and of devout imitation of their heavenly Queen." Union  Imitation of Jesus and Mary, so as to become like them, and trying to develop as constant as possible a realization of His and her presence. Dependence  Give to Jesus and Mary the right to dispose of everything we have, temporal and spiritual. Obedience  Jesus and Mary have the right to ask us to do anything at all, even without reward. In consecration, we recognize that right, give it on a basis of love, and plan to carry it out with fullest generosity. St. Maximilian Kolbe liked to speak of the relation of consecration to our baptismal promises, in which we promised to renounce satan and all his works, and to follow Jesus, by whom we are "sealed" in baptism as His property. Consecration is the fullest kind of response to and carrying out of these promises. Mary, in view of her Immaculate Conception, was most fitted to respond most fully, and that she did, with a fullness and perfection beyond our ability to visualize  for we recall that Pius IX told us that even at the start of her existence, her holiness was so great that "none greater under God can be thought of, and no one but God can comprehend it."